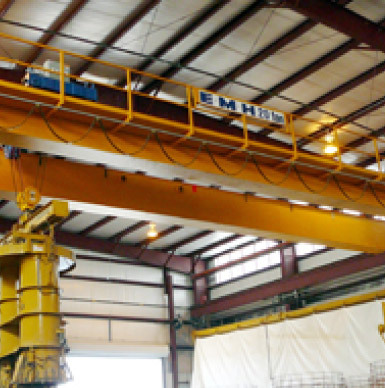 Protecting Your Cranes and Crane Hoists in Hazardous Areas | EMH, Inc. There are numerous conditions that make protecting your cranes and crane hoists including the presence of gases and dusts and high temperatures. Hazardous Duty Enclosures – Enclosures designed to contain any explosion that might occur if hazardous vapors were to enter your crane control enclosure. These enclosures are also designed to cool and vent the products of this explosion as to prevent the surrounding environment from exploding. Hazardous Duty Motors With Modular Brakes – EMH’s crane hoists are now being built to include motors and brakes that conform to safety standards and can meet custom requirements. As there are a multitude of product certification schemes around the world, EMH focuses on IECEx/ATEX certified motors as our standard. Hazardous Duty Switches – To keep your crane and crane hoist operating safely EMH also provides both a rotary limit switch for hook upper & lower limits and weight operated limited switches. Additional Hazardous Duty Materials – EMH also offers class and division rated cabling, hazardous duty fittings, spark resistant features, and vibrating horns and strobe lights to alert workers during a potential event. Contact EMH for additional ways to protect your employees from potential accidents.